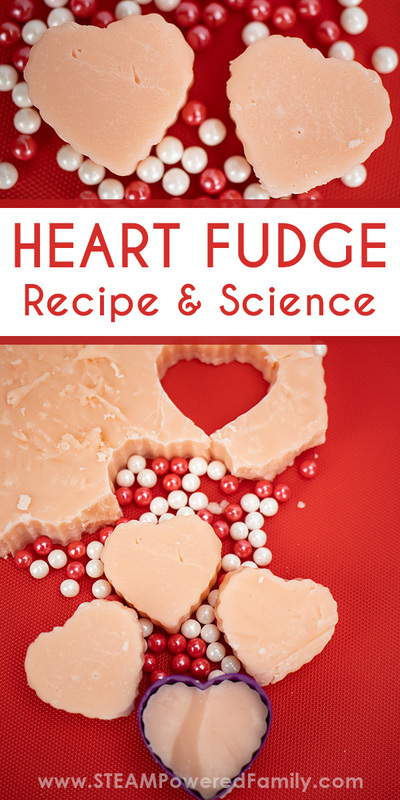 This Valentine’s Day Fudge Recipe continues our love of kitchen science with some delicious heart fudge treats! 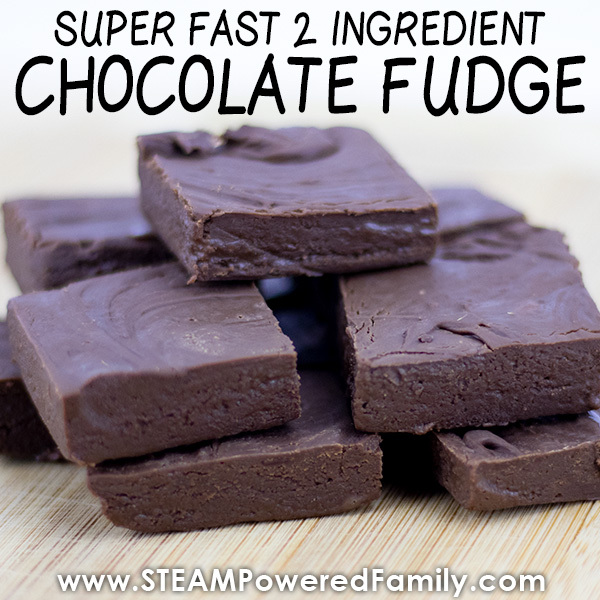 The best part is that we have learned that this easy fudge recipe will turn out perfect every time… if we remember to measure our ingredients and don’t forget any steps! 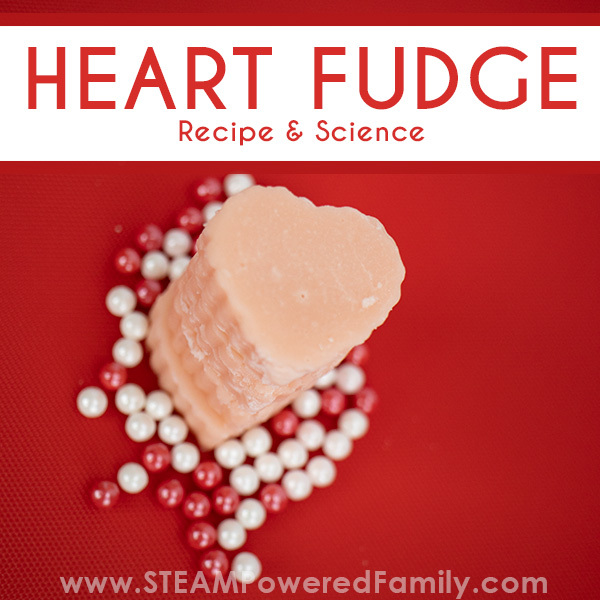 Fudge is a great science project exploring crystallization with your tweens and teens. 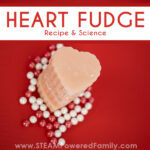 This heart shaped fudge is the perfect homemade sweet treat to celebrate a day of love! One of the things we have learned over time and practice is that when you find the perfect recipe, you stick with it. This is one of those recipes. The kids have learned the importance of measuring the ingredients (add in some measurement conversions for some extra math practice!) and following each step. If we do this, we get delicious fudge every time. One of the reasons we enjoy making fudge is that we find crystallization fascinating. 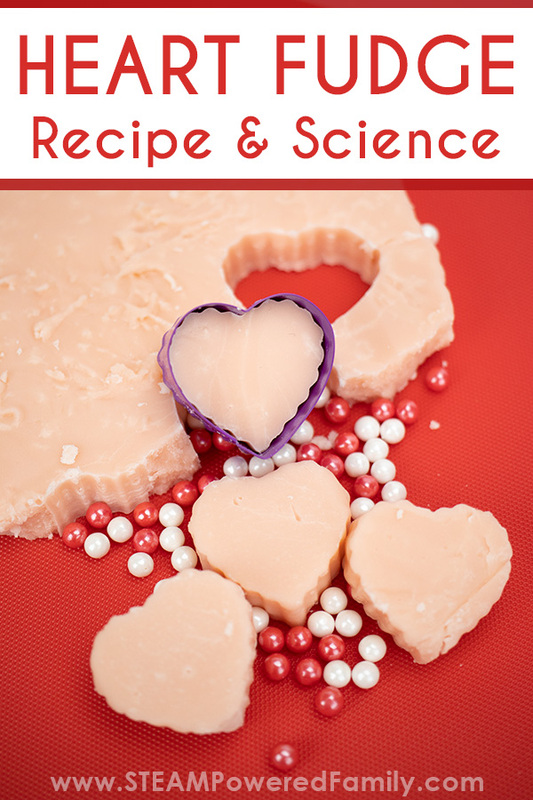 Candy making is such a fun edible science project. Fudge is a crystalline candy meaning that we want crystals to form in our syrup. However, unlike rock candy where we allow the sucrose crystals to grow large, we need to control the growth of crystals vigorously. You can experience this crystallization if you think about the texture of different candies. 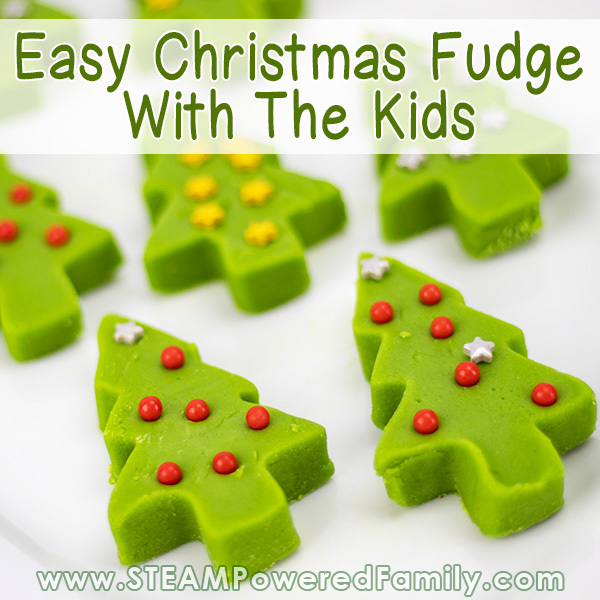 Fudge is a very smooth candy that melts on the tongue. If you mess up the recipe, you might notice your fudge is “gritty”. This is caused by failing to control those crystals forming. 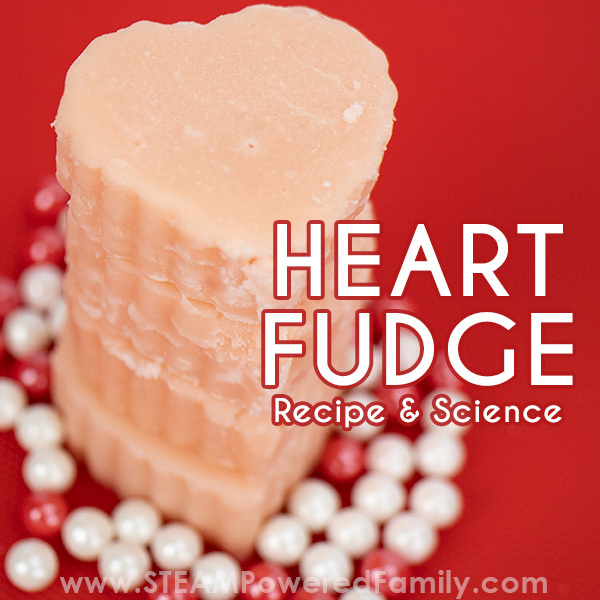 So how do we control crystal growth in fudge? We do this by adding butter and cream to inhibit the crystal growth and by beating the syrup as it cools down. Specifically, we melt the sucrose to 116 c, 240f. (soft ball stage in candy terms). We will also need to be very careful not to jiggle or disturb our syrup as it cools until it reaches a temperature where the crystals start forming again. Then we will beat the mixture until it thickens. I find the best temperature to be around 75-80c 160-176f. However, keep in mind that location and atmospheric differences may result in a slightly different temperature being perfect for you. 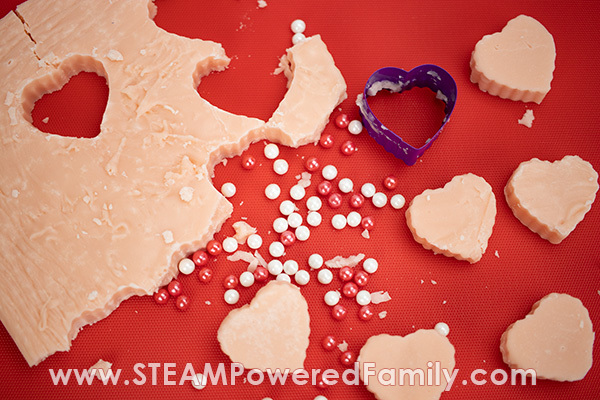 Learn more about this in our Candy Science study. Put the butter, sugar, and cream in the saucepan and heat to a simmering boil, stirring all the time. Use a medium low heat and gentle, constant stirring to avoid scorching the sugars and ruining the flavour of your fudge. Place the candy thermometer into the mixture making sure the bulb at the bottom does not touch the bottom of the pan. Stop stirring the mixture at this point and allow it heat until it reaches 116 C/240 F.
Remove from the heat and carefully pour into a bowl. Caution, it is very hot! This step should be done by a responsible adult or teen only. The reason I suggest pouring the mixture into a bowl is to stop the syrup heating from the hot pan. It does require that you decant as smoothly as possible with no scraping of the pan as this will cause crystals to form before we are ready. Let it rest for a few minutes for the mixture to cool a little until it reaches 75-80 C/167-176 F. Use your candy thermometer to ensure accurate temperature readings. Add the vanilla essence and the food coloring and begin to beat the mixture as it cools down. Beat until the mixture thickens about 7 – 10 minutes. Pour into the baking tray and allow to set. Around 2 to 4 hours. 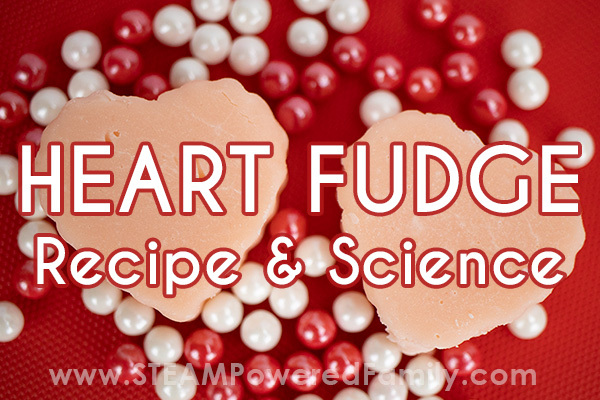 Carefully turn out the fudge and using a metal cookie cutter cut out heart shapes. 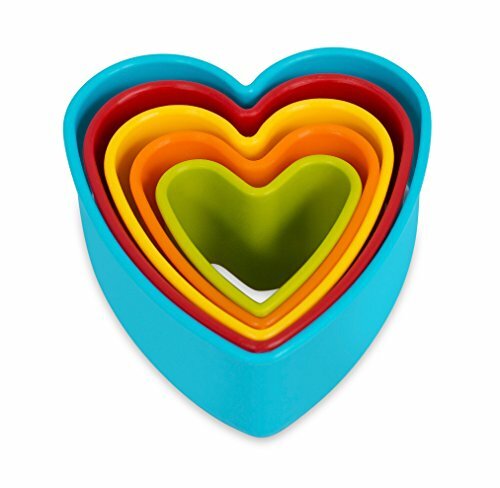 Press slowly then carefully push the hearts back out of the cookie cutter. This is best to do while the fudge is nice and fresh. Store your fudge in an air tight container or wrap with plastic wrap to keep it fresh. I store mine in the fridge to help it last even longer. But who am I kidding, this stuff doesn’t last long at all! Put the butter, sugar, and cream in the saucepan and heat to a simmering boil, stirring all the time. Use a medium low heat. Place the candy thermometer into the mixture. Stop stirring the mixture at this point and allow it heat until it reaches 116 C/240 F.
Remove from the heat and carefully pour into a bowl. Decant as smoothly as possible with no scraping of the pan as this will cause crystals to form before we are ready. Let it rest for a few minutes for the mixture to cool a little until it reaches 75-80 C/167-176 F.
Add the vanilla essence and the food coloring and begin to beat the mixture as it cools down. Beat until the mixture thickens, about 7 – 10 minutes.